It is easy to make fun of the Liberals and Catherine McKenna’s remarkably ill thought-out price on carbon “pollution” but what might work better? Well, obviously nuclear, especially given the advances in small, safe reactors; but that is a ten year program at minimum and would cost a lot of money. How can we cut Canada’s carbon pollution by over 2 million tons this year and for years into the future? Here is a rather crappy looking spreadsheet which will, no doubt, break my blog. No matter. It lists Canada’s top ten source countries for immigration, their per capita carbon footprint and the effect of having these people become Canadians with out 15.1 tonne per year per capita carbon footprint. You will probably have to scroll sideways to see the totals but, by brining in 165,000 extra people who, with the exception of our american friends, have lower carbon footprints than we do, we are adding 2.1 million tonnes of carbon a year to the load. Simply by closing the immigration door we would be saving that 2.1 million tonnes this year and for years afterwards. Can’t wait for Minister McKenna to announce the cessation of immigration from all countries with per capita carbon emissions less than Canada’s. Catherine McKenna was on Evan Solomon’s CTV show and Evan asked a slightly difficult question about her carbon tax and its opponents. How much will the proposed per tonne price on “pollution” reduce the emissions of this “pollution”? How much will the “price on pollution” effect the Canadian economy? Now these are basic questions and make no assumptions about the reality or unreality of “climate change”. They are certainly questions which a competent Minister proposing a significant tax should be able to answer. Now the answers will, necessarily be qualified: plus minus 10% is a reasonable standard. But the Minister has to be able to attach numbers to her proposals. Otherwise she really will deserve the nickname “Climate Barbie”. Nasty Rebel Media refers to Canada’s Environment Minister, Catherine McKenna as “Climate Barbie”. Pretty mean. Ms. McKenna is well credentialled, has a real record of accomplishment before politics and can’t help that she’s blonde. But the Climate Barbie nickname has its roots in the fact that McKenna, like a wind-up doll, insists on calling those of us who disagree – usually on rather well-founded grounds – with the climate change consensus “climate deniers”. Which is as insulting as it is idiotic. As Sheila Gunn Reid of The Rebel suggested – having coined the nickname – we’ll stop calling McKenna Climate Barbie when she drops “climate denier” from her lexicon. There is plenty of room for reasoned debate and dissent from the climate change consensus. A non-Barbie Minister would recognize that fact and stop slagging the people who take climate change seriously enough to question mainstream data, models and prescriptions. Repeating, by rote, “climate denier” whenever confronted with disagreement puts McKenna firmly in the Barbie camp. Now, she asks that we stop calling her that because her young daughters might hear and that would be a bad thing. In fact, her daughters, on hearing their mother referred to so pejoratively might ask why their mother seems content to mouth platitudes rather than digging into the positions on both sides of the question. McKenna is not an idiot. However, for the moment, her role as the all in spokesperson for an increasingly untenable, model based, scare story which is designed to justify massive tax increases for ordinary Canadians, forces her to sound like one. Just like Barbie. This article has been mentioned all over the conservative and climate sceptic blogosphere. Most of the links had it behind a paywall, this link is open. James makes the point that even with Trump walking away from Paris and the science becoming less alarming by the minute, the climate change scam will take a while to fade into well-deserved obscurity. Too many scientists, policy wonks, journalists and politicians have nailed their reputations to the eternal truths of CO2 driven global warming. Too many huge companies stand to make too much money from “solving” this non-problem with all manner of pointless, but gratifyingly expensive, solutions – wind, solar…biomass. Wonderfully corrupt Third World governments and their enablers at the UN are not about to jump off the guilt driven gravy train. By walking away from Paris and the unicorn fart economics of the “Green Fund”, Trump has killed climate change hysteria and its funding stone dead; but like a headless chicken, there may be a few circuits of the barnyard left in the beast. Should be starting now: Trump can either dump Paris and stick with serious science and economics or he can fudge. I am hoping he’ll dump but I expect a fudge. Update: Either way Trump is keeping us waiting…12:09. According to You-tube there are 51,418 people watching this stream. 12:20, 62k and change. Trump is keeping us on the edge of our seats. !2:27…on a different feed Steve Bannon looks very happy. Update #3: Keeping my campaign promises. The United States will withdraw!!! Update #4: But we’ll renegotiate a new deal….getting out but start to negotiate. So Trump is basically treating Paris as a trade deal that the US was screwed on. He is not going after the science. Just the trade and economics. Kills “Green Climate Fund”. Could cost 2.7 million lost jobs. Update #5: Goes after the Green Fund. Points out the rest of the world is not contributing. Blames Obama for taking money from anti-terror for Green Fund. Says no one knows where the money is going. Points to US debt. Update #6: Reassertion of America’s sovereignty. Update the Last: And he is done. If Trump accomplishes nothing other than the Gorsuch appointment and pulling out of Paris he will be a grand President. At a guess, after the media has gone crazy, the effect of today’s announcement will be to collapse the crazier end of the Greenie cult. Other countries will walk away from the agreement. The science will be scruitinized. The 97% consensus lie will be exposed and, with luck, “climate change” will be looked at carefully, with a mind to the inherent uncertainties of the science and the cost/benefits of action in the face of those uncertainties. A great day for America and the beginning of the end for the hysterical, expensive, group think which climate change has occasioned. The NYT published a rather mild piece on climate policy written by its new “conservative” hire Bret Stephens. The consensus claque went nuts. Dana Nuccitelli, who was in on the fraudulent Cook et al consensus paper so often cited, put up a spectacularly unhinged piece at the Guardian rallying the troops and denouncing Stephens as a “hippy puncher”. Subscription are being cancelled as we speak. The, more or less, instant over the top reaction to a not terrifically radical suggestion that the more strident claims of the climate alarmists need a second look is not surprising. In fact, it is pretty much the only reaction the climate alarmists can have. The problem climate alarmists have, along with the fact fewer and few people take climate alarmism seriously, is that their coalition is fragile. At one point, I would say about a decade ago, the need to “do something” about “climate change” as a motherhood issue. After all, the science was certain and the time for debate was over. People who were unwilling to accept the innate truth of the IPCC reports and the urgent need for expensive action were “deniers” and entirely excluded from the scientific or policy discussion. The alarmists knew The Truth. As Stephens points out in his piece, 100% certainty is almost always an indication of a cult rather than any sort of actual truth. And the problem with complete certainty is that there is no flexibility. Either the claim is correct in every particular – which is very unlikely – or it is not. So, for example, the decade old consensus position that the world was growing warmer and warmer and that increases in CO2 were responsible for that warming was a hostage to fortune which was very unlikely to survive. One cooling year could be waved away as “weather”; declining estimates of temperature sensitivity to CO2 were just obscure enough that they could be ignored or suppressed; but the overall claim and the consensus which surrounded it were and are extremely vulnerable to contradiction or even mild doubt. The economic side is even worse. It turns out that renewable energy – windmills and solar – costs a fortune and is profoundly unreliable. Governments which went all in for renewables (see Ontario) found their energy prices hockey sticking and the popularity plummeting without, as it turns out, making even a slight impression on the rise of CO2 concentrations. The economics of climate change and its “mitigation” are a shambles. And it is beginning to dawn on assorted politicians that they might have been railroaded with science which was not quite ready for prime time. Which makes it all the more imperative for the Nuccitelli and DeSmog blogs of this world to redouble their attacks on even mildly sceptical positions. Had the alarmists been less certain their edifice could have easily withstood a recalibration of the science and a recalculation of the cost/benefits. But they weren’t. They went all in for a position which claimed to know for certain that CO2 was driving world temperature and that there was no other possible cause for an increase or decrease in that temperature. The problem with that position is that it was premature and very brittle. 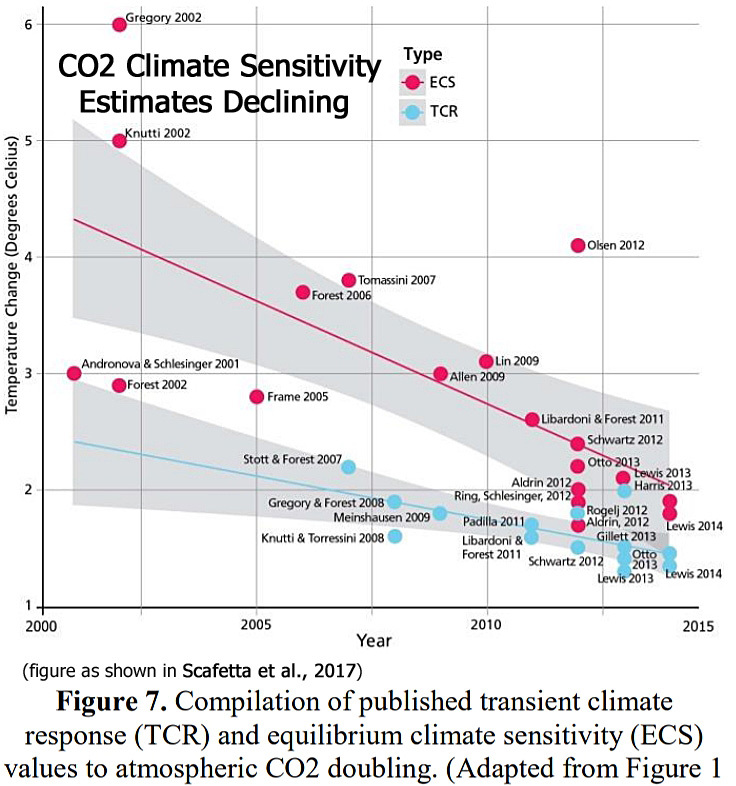 As lower sensitivity estimates emerge, as other, non-CO2 driven, temperature controls are discovered, consensus climate science becomes more and more embattled. What had looked like a monopoly on political discourse and media comment begins to fray. The advent of Trump and a merry band of climate change skeptics in the regulatory agencies and in Congress, has pretty much killed any forward motion for the climate alarmists in the US. And the US is where this battle will be won or lost. However, the sheer cost of so called “carbon reduction” schemes in the UK, Germany and the rest of Europe has been staggering and has shown next to no actual benefit so scepticism is rising there too. China has both embarked on an embrace of climate change abatement and the construction of dozens of coal fired electrical generation plants every year. What had been a climate change thought monopoly a decade ago has fractured along dozens of scientific, economic and policy lines. Some of the more intelligent alarmists realize that if dissent is not snuffed out ferociously it will spread. Heterodox science will appear in respectable journals, non-conforming scientists will be invited to appear before Congress (as happened a few weeks ago), the costs and limited to non-existent benefits of renewable energy and carbon taxes will be closely examined; once the thought monopoly is broken the collapse of the climate change scam is inevitable. We were promised that climate change would threaten food supplies…especially wheat. From Iowa to China, years of bumper crops and low prices have overwhelmed storage capacity for basic foodstuffs. Global stocks of corn, wheat, rice and soybeans combined will hit a record 671.1 million tonnes going into the next harvest – the third straight year of historically high surplus, according to the U.S. Department of Agriculture (USDA). That’s enough to cover demand from China for about a year. That is the pesky thing about the real world, it keeps breaking models. As I write the world’s media, having hyped global warming and the Paris COP21 for the last six months, is trying to figure out what is in the so called historical agreement. The short answer is: not much. There are some pious promises to meet each country’s goals – promises which are to be monitored by the countries themselves. And there is a really sincere promise to “mobilize” that 100 billion to help the developing world which was promised at the last COP and, as I recall, the COP before that. There is inadvertently honest paragraph 17 which acknowledges that the national promises will lead to 55 gigatons of CO2 emissions in 2025 and 2030 which is 12 percent rise from the 2014 level of 49Gt. Para 17 also notes that the promised reductions will lead to a rise in temperature over 2 degrees. Naomi Klein is disappointed and James Hansen has declared COP21 a fraud in the Guardian. For those of us who are sceptical about the CO2 theory of global warming, the entire Rio to Kyoto to Copenhagen to Paris exercise has always been more annoying than substantive. the great and the good were meeting to discuss a “problem” and a “solution” which rested on shakey, untested science. But the good news out of Paris, the signing of an entirely toothless, legally non-binding, document hailed by media and politicos alike as “the end of the fossil fuel era” is the high water mark of the loony Green war on CO2. Never again will the green world manage to get the media attention that COP21 has received. And without that attention an already indifferent public will turn to other issues. Better still, the global warming/climate change scam needed increasing temperatures to keep it alive. It needed shrinking sea ice and rising sea levels. It needed “the evidence” to either support the “consensus view” (itself a statistical fraud) or at least not contradict that view. There is every indication that the “pause” may be a prelude to a decade or two of global cooling. There is not a climate model used by the IPCC which predicts or even has a mechanism which might explain a statistically significant fall in temperature. When this year’s El Nino is finished -likely quite soon – the temporary goosing of the temperature record will be done as well. Normally, after an El Nino there will be a cooling La Nina. Depending on how cooling that turns out to be, it may very well be sufficient to turn the global temperature record negative in the face of continuously rising CO2 levels. Given that the bogus Paris document is predicated on the IPCC models linking temperature to CO2, when those models collapse the scientific scam will be over. Without the “science” the overall “climate change to transfer wealth” scheme will lose the little momentum it has left. With the Paris flim flam in hand the political classes will have “saved the world” and will, I expect, start trying to change the subject. Quickly. The amusing part of the entire charade is that, when you look at the world relative to its state in 1992 when the whole climate madness began in Rio, the less developed world has radically developed. India had a purchasing power parity GDP of 1124 billion in 1992, it was 7375 billion in 2014. China had a purchasing power parity GDP of 1438.13 billion in 1992, it was 17617 billion in 2014. Unsurprisingly, India is none too eager to stop buring fossil fuels and China’s great concession has been to accept unlimited growth in emissions until 2030 when, it really does promise to start reducing emissions. Whack-a-doodle warmists and greenies will, as per usual, be sad when the Paris Conference ends with a non-enforcable damp squib of a not-a-treaty agreement. The more intelligent of them will be very depressed indeed because the wheels continue to fall of the science as the Pause lengthens, the models depart further from the observations and, oops, Arctic ice extent is the highest its been in a decade. The “science” behind the climate hysteria is crumbling and the green dream of a reversion to horse and buggy days is collapsing faster than the price of oil. The fake consensus is under attack, the models are failing and, despite the great and the good all claiming that we’ll all be baked, the general public has turned away from global warming alarm.